Los Angeles - The J. Paul Getty Museum announced today the acquisition of the Rothschild Pentateuch, the most spectacular medieval Hebrew manuscript to become available in more than a century. The acquisition was made possible with the generous support of Jo Carole and Ronald S. Lauder. Created by an unknown artist and dated 1296, the manuscript’s pages are filled with lively decorative motifs, hybrid animals and humanoid figures, and astonishing examples of micrography--virtuosic displays of tiny calligraphy in elaborate patterns and designs. The vibrant colors and gleaming gold distinguish this manuscript from most medieval Hebrew book production, which followed a largely textual tradition. It stands apart from other medieval examples through the appeal and extent of its illustrated program. The text contains features that indicate it may have been written in France for Jewish emigres who had been expelled from England in 1290. The illumination was likely completed in France or Germany. The Pentateuch contains the central sacred text of Judaism--the Torah in the strictest sense--comprising the Five Books of Moses: Genesis, Exodus, Leviticus, Numbers, and Deuteronomy. The manuscript’s lavish illumination divides the text into sections to be read weekly so that the entire Torah would be read over the course of a year. The opening of each of the five books is celebrated with monumental Hebrew initials intertwined with lively marginal figures and, in one case, a full-page illumination. 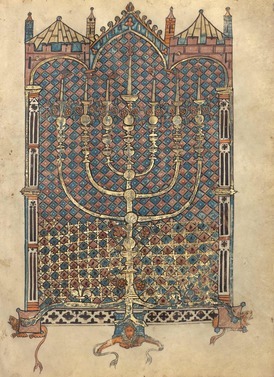 With its seemingly endless variety of illuminated motifs ranging from the imposing to the whimsical, the Rothschild Pentateuch is a prime example of the heights of originality and magnificence that Hebrew illumination achieved and stands as the most extensive illuminated program of any northern European Hebrew Bible to survive from the Middle Ages. In a rare deviation from the rest of the manuscript’s aniconic approach, there is one illumination featuring full human figures that was added at a later date. In the second half of the fifteenth century one page was replaced with a new insertion, carefully replicating the text and commentaries. The folio can be identified as the work of Joel ben Simeon, one of the most celebrated Jewish artists known from the period. The replacement miniature represents the sole figural narrative in the Rothschild Pentateuch, but was inspired with the same kind of ingenuity that characterizes the rest of the manuscript. The Rothschild Pentateuch was created in 1296 perhaps for a patron originally from England. It was carried through the centuries from France or Germany to Italy and Poland, and was eventually acquired by Baroness Edmond de Rothschild at some point before 1920, and then given after World War II to a German-Jewish family, who later settled in Israel, as a part of an exchange agreement. The Rothschild Pentateuch will make its debut at the Getty Center in Art of Three Faiths: A Torah, a Bible, and a Qur’an on view August 7, 2018 to February 3, 2019, an exhibition showcasing for the first time the sacred texts of Judaism, Christianity, and Islam. The practitioners of these three faiths have been called people of the book for their shared belief in the importance of divine word, rendered in medieval manuscripts in glowing gold and luminous colors on parchment. Three spectacular examples from the Getty’s permanent collection, including a Christian Bible and a Qur’an together with the newly acquired Torah, will be featured in this spotlight show.